This is just one of those cards that started out as an experiment, then turned grunge! This is the experimental part. it is inked, stamped on, torn pages from an old book added – and inked some more. 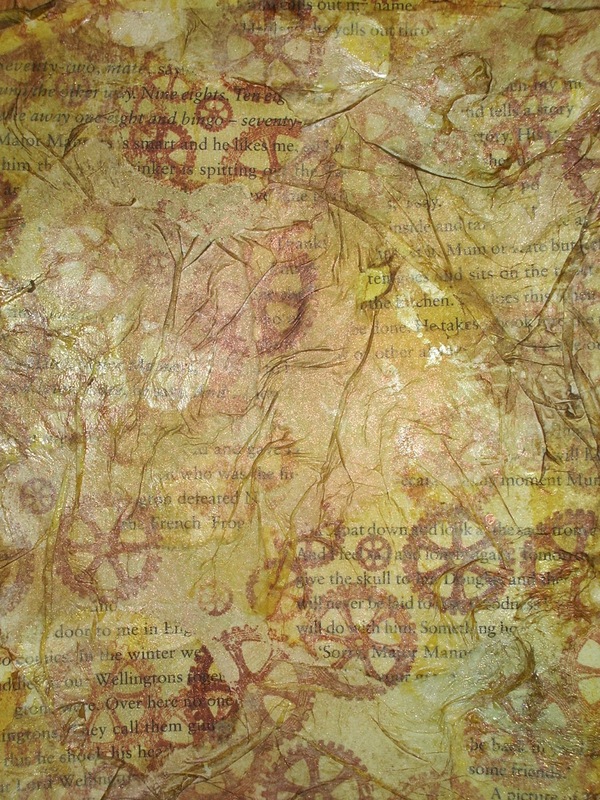 And I added texture with holey tissue paper. Just a whole lot of fun really!!! What I haven’t shown is when I then splatted some bleach on, added more torn bits and then inked over it in blue hues. My discovery for this fortnight is that you can paint the bleach on and have a more controlled area to work with instead of just splatters. Then I had a break and came back in a grunge frame of mind!!! I had no idea what to do with my background. and added a grungy flower! and this was the first card that I’ve made that it seemed to go on beautifully. runners up and spotlights are up for grabs to! These girls are amazing each and every time they create something! Grunge is good and this is great! Playing with tissue paper is so much fun! 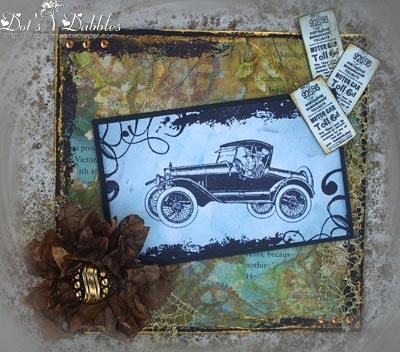 Love the background and it is the perfect setting for the old jalopy! You rocked this! Hi Dot, LOVE your background and then the way you grunged it up – fab. I think you've all excelled yourselves this time Dot as this is amazing too! What a fantastic textured background and it doesn't need any more than the image and flower as it would be a shame to cover it up any more! Grunge vintage! Nice work! Thanks for joining Craft Your Passiont this week! Hi Dot, wow your background is fabulous and I love the flower – gorgeous card! Fantastic grunge background, its a great card and the flower is a beauty. Dot, your card looks fantastic – love the background technique. Also the image is wonderful. You sure have been having fun Dot and I see what you mean about the bleach, it allows you to add other colours easily. The flower is perfect and I love the added tickets. Another of your wonderful creations. Enjoy Adelaide. Thanks for the chat the other day. WOW!! this looks amazing. That background looks great. Thanks so much for playing along with us over at CCCB! How awesome, thanks for sharing it with us at CCCB! That is an amazing background Dot and really all this card needed was a simple embellishment such as the flower, to allow that amazing stamping to shine. LOVe your background! I always love to see what all the DT members have done with the theme- this is beautiful, I like your take on the 'challenge'. The card is really really beautiful. Sometimes its hard to cover up those awesome backgrounds. Its so cool the way it is. Your card looks great, nicely done. Lovely card! I like everything in it! I love that background you created! It looks great behind your car image. Gorgeous love this design !